WASHINGTON (CNN) -- Senate Republicans on Wednesday blocked President Obama's choice to be the number two official at the Department of the Interior. 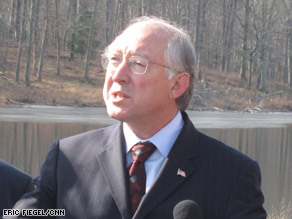 Interior Secretary Ken Salazar, above, will "have David Hayes working with him," Sen. Harry Reid says. On a vote of 57 to 39, they sustained a filibuster against David Hayes to be deputy interior secretary. It marked the first time the Senate has voted against one of Obama's nominees. Sen. Robert Bennett, R-Utah, is leading the fight against Hayes. Bennett says his opposition is not about Hayes' qualifications. Rather, Bennett says, the administration has not adequately answered his questions about why oil and gas leases in his state -- which were approved in the last days of the Bush administration -- were canceled by the Obama administration. He called the actions "political." Senate Majority Leader Harry Reid, D-Nevada, said the disputed leases are near national parks and the Interior Department did not cancel the leases but pulled them for review. Reid said that he has hope that Hayes will be confirmed -- eventually. "David Hayes will be confirmed. If I have to wait until Al Franken comes, he is going to be confirmed. ... Everyone should understand that," he said Wednesday. "If we happen to lose this today, I will just move to reconsider until we have the votes." "[Interior Secretary] Ken Salazar is going to have David Hayes working with him," he added. If Republicans ultimately block Hayes' nomination, it will be the starkest illustration yet of what it means for Democrats to have 59 seats -- just one shy of a filibuster-proof majority -- as Franken's Minnesota Senate race remains unresolved. Courts will decide whether Franken's disputed recount victory against incumbent Republican Norm Coleman will stand. "The American people deserve better than political games that do nothing but waste their time, and the president deserves to have a complete lineup when his team takes the field on the most important issues we face," Reid spokesman Jim Manley said. Democratic leaders said they would hold another vote as early as next week, when three Democratic senators who were not able to vote Wednesday would be available to give Democrats the 60 votes they need to end the filibuster and approve Hayes. Two Republican senators, Jon Kyl of Arizona and Olympia Snowe of Maine, voted in favor of Hayes. A Republican leadership aide said another vote won't be needed if Bennett's concerns are addressed by the Interior Department. CNN's Dana Bash and Ed Hornick contributed to this report.